My recent Rehab was the worlds UGLIEST table. I am always looking for furniture (when I need it, because lord knows I have too much) that has character since we live in a newer house lacking character. 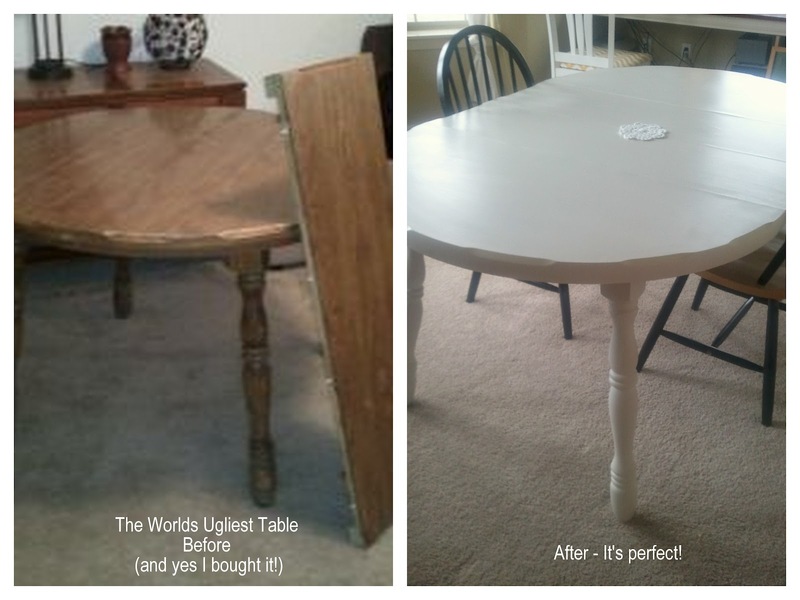 I have been severely struggling with ideas for the bonus room aka my sewing (class)room and had a few good friends swing by to get me out of my rut all three confirmed put a table in the middle so I ventured on to craigs list for a few days looking for a table I liked and was in my teeny price range....then I spotted it, a 70's solid wood, laminate top, covered in years of food grime and lacquer for the mere price of 25 bucks. What made me want this hideous table?! It has GREAT legs ;) I am a total leg girl when it comes to furniture! I made the purchase for 20 bucks and my husband could not believe he was having to lug it home but I was confident it had great potential and was the perfect size for the awkward room.